Rubbing Alcohol Drinking And Inhaling: Is Isopropyl Alcohol Toxic? Rubbing Alcohol Drinking – Is Isopropyl Alcohol Poisonous? Isopropyl alcohol is a common reagent used commercially in solvents, disinfectants, pharmaceuticals, antifreeze, inks, and other household products. Commonly known as rubbing alcohol, this substance is a colorless, bitter liquid with an aromatic odor. Due to its ethanol content isopropyl alcohol ingestion for recreational purposes has become a trend. This guide explains the composition, metabolism, and risk of addiction to rubbing alcohol uses. How can rubbing spirits be consumed? What happens if one consumes rubbing alcohol? What are the side effects of rubbing alcohol? Rubbing spirit is a common name for isopropyl reagent popularly used as surgical spirit or topical antiseptic. Isopropyl alcohol structure C3H80, largely used as a disinfectant, differs significantly from ethyl C2H60 which is used in the manufacturing of alcoholic beverages, even though both are often referred to as rubbing alcohol. Formulation standard volume of isopropyl spirit differs in various regions and between manufacturers. Content may range from 70 to 99% isopropyl alcohol. So what is rubbing alcohol made of? What happens if you drink rubbing alcohol? This is a very valid question. The distinctively bitter taste of the substance might suggest that drinking isopropyl alcohol may not be acceptable. People who result to drinking rubbing alcohol for the intent of experiencing intoxication will find that the substance is quite different from the conventional beverage. Drinking– those that drink rubbing alcohol likely do this as a last resort to achieve the euphoric feeling; however, there are dire consequences involved with this action, such as isopropyl alcohol toxicity. Huffing and Sniffing – Isopropyl alcohol inhalation is just as dangerous as drinking. It should be discouraged in any form as this can be lethal. It is advised that the room is well ventilated when using the isopropyl reagent. Alcohol abusers may result in the consumption of Isopropyl reagent as a means of “getting high” due to its strong alcoholic content. This is often common with unguided teenage drinking and as a last resort for users who may be experiencing extreme withdrawal symptoms. A common question with dedicated drinkers is “can you get drunk off rubbing alcohol?” the answer to this is yes. After all, it is a highly concentrated form of substance. However, the ingredients and composition of the substance make it unpleasant for drinking and toxic as well. What happens if you drink isopropyl alcohol? Even though the isopropyl substance can induce intoxication faster than the regular beverage due to its extremely high alcohol levels, it is unsafe and can result to isopropyl alcohol poisoning, which presents with extreme nausea, vomiting, throat burns, and can lead to death, though cases of mortality are rare. How is Isopropyl alcohol toxic? The mechanism of digestion for Isopropyl differs from that of ethyl in terms of speed of absorption. The substance is quickly absorbed into the organs causing an increase in the osmol gap. This can lead to ketonemia/ketonuria( High levels of ketone bodies in the blood or urine respectively) or both. Binge drinkers engage in any form of the substance that may contain elements of ethanol in the desperation of finding alternatives to drinking regular beverage. 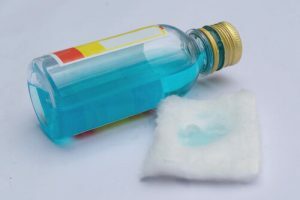 Sadly, these alternative substances include unsafe products such as mouthwash [the Listerine alcohol content is about 14% to 26.9%], cough syrup, and hand sanitizers which are even more dangerous as they present with immediate health problems. A person who has problems with excessive drinking, treating alcoholism, and trying to maintain sobriety may become tempted to drink the household methylated spirit for relief from severe withdrawal symptoms. Any person of age 12 and above can fall victim to this addiction which usually is caused by excessively indulging in alcoholic beverages. This substance can cause intoxication and increased tolerance to high alcoholic content leading to addiction. This situation can make withdrawal even more difficult. In the case of addiction to isopropyl, a rehabilitation facility for alcoholics would be the best solution. Drinking Isopropyl reagent can lead to addiction, and this can be difficult to deal with alone. Alcoholism can lead to depression and all forms of antisocial behaviors. It is also dangerous to health and can only be controlled with the help of a professional. AlcoRehab » What is Alcoholism? A Complete Guide to Alcohol Addiction » Rubbing Alcohol Drinking – Is Isopropyl Alcohol Poisonous?